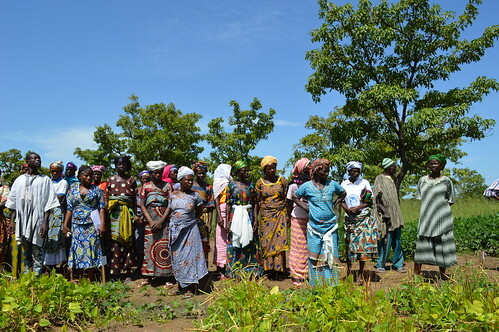 a Field Day at Passe, Upper West Region, Ghana (Photo Credit:Charlie Pye-Smith ). In west Africa, Africa RISING is being implemented in 25 intervention communities in the three northern regions of Ghana, and 10 villages in the Bougouni- Yanfolila and Koutiala districts of the Sikasso region in southern Mali to address the challenges of small-scale, crop−livestock systems outlined above. It is intended to result in spillover effects to other similar agroecological zones. Participatory research and extension approaches including multistakeholder research-for-development platforms are used to identify constraints and plan appropriate interventions. Partners are trying out new ideas through farmer experimentation and evaluation to intensify production systems; and importantly, monitoring the process through lesson learning and experience sharing to facilitate adoption. 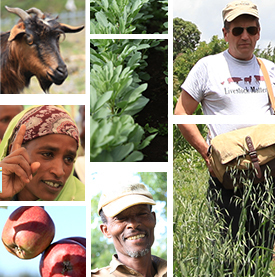 Activities include testing and dissemination of improved crop varieties (drought and Striga resistant, food−feed crops) and livestock breeds (dairy goats and sheep); appropriate agronomic (planting density, intercropping and cereal−legume rotations, multiple cropping, and agroforestry) and animal husbandry practices (semi-intensive and intensive management, dry-season supplementation, vaccination and deworming, housing, intensive feed gardens, fodder banks, dryseason supplementation, deworming); value-addition, reducing pre- and postharvest losses, linking farmers to input and output markets, and ensuring better integration of the crop and livestock enterprises. Approaches to improve household nutrition, especially that of women and children are being tested. They include diversifying household nutrition by using locally available ingredients from crops, trees, and livestock; introducing new nutritious crops; and food preparation techniques for more nutritious meals and weaning food. Nutrition field schools are being used to promote knowledge exchange on best practices for processing and storage of cereals, legumes, and vegetable-based diets.